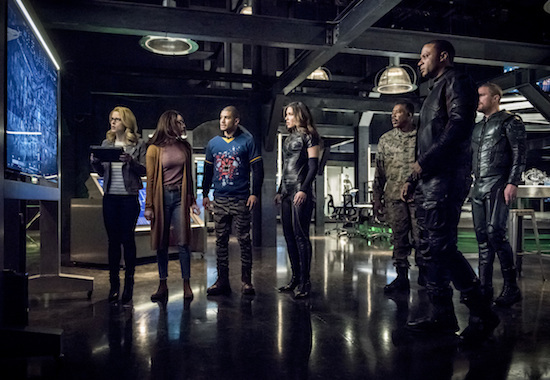 Arrow — “Spartan” — Image Number: AR719a_0154b — Pictured (L-R): Emily Bett Rickards as Felicity Smoak, Kacey Rohl as Alena Whitlock, Rick Gonzalez as Rene Ramirez/Wild Dog, Juliana Harkavy as Dinah Drake/Black Canary, Ernie Hudson as General Stewart, David Ramsey as John Diggle/Spartan and Stephen Amell as Oliver Queen/Green Arrow — Photo: Dean Buscher/The CW — ÃÂ© 2019 The CW Network, LLC. All Rights Reserved. 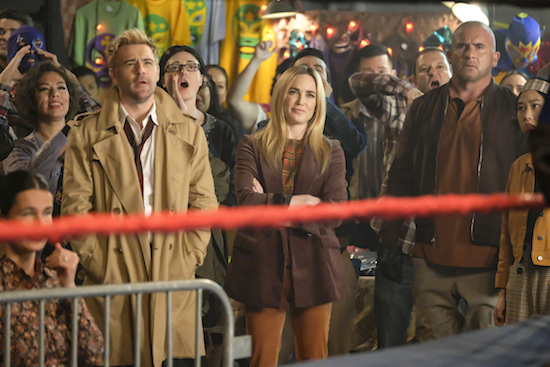 LEGENDS OF TOMORROW’s Constantine (Matt Ryan) teams up with Nora (Courtney Ford) and Sara (Caity Lotz) to defeat a tricky demon on the Monday, April 22 episode. 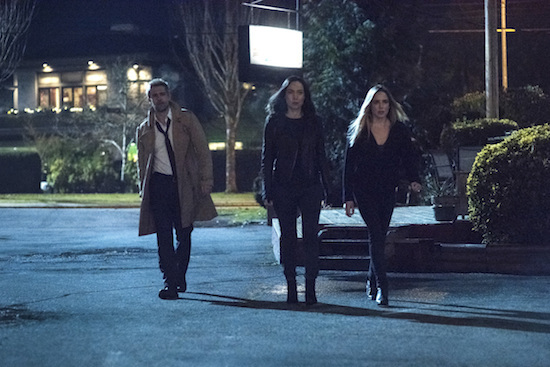 DC's Legends of Tomorrow -- "The Eggplant, The Witch & The Wardrobe -- Image Number: LGN412b_0039b2.jpg -- Pictured (L-R): Matt Ryan as Constantine, Courtney Ford as Nora Darhk and Caity Lotz as Sara Lance/White Canary -- Photo: Dean Buscher/The CW -- ÃÂ© 2019 The CW Network, LLC. All Rights Reserved. 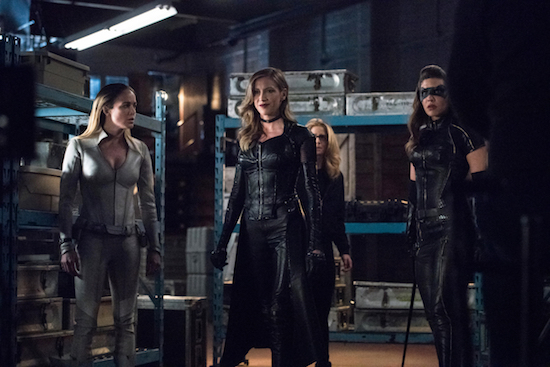 Arrow — “Lost Canary” — Image Number: AR718B_BTS_0356r.jpg — Pictured (L-R): Behind the scenes with Caity Lotz, Katie Cassidy, Emily Bett Rickards and Juliana Harkavy — Photo: Dean Buscher/The CW — ÃÂ© 2019 The CW Network, LLC. All Rights Reserved. The Legends end up chasing Jane Austen (Jenna Rosenow) on the Monday, April 15 episode of LEGENDS OF TOMORROW. 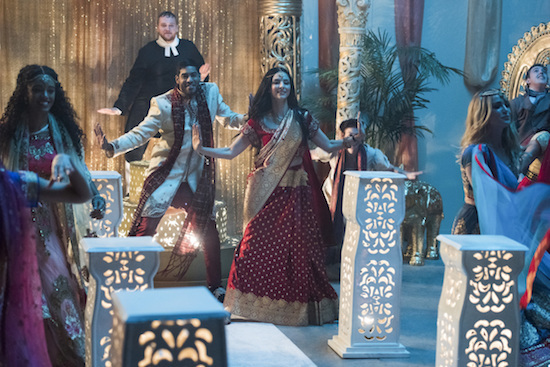 DC's Legends of Tomorrow -- "Seance & Sensibility" -- Image Number: LGN411b_0273b.jpg -- Pictured (L-R): Maisie Richardson-Sellers as Charlie, Sachin Bhatt as Sunjay, Tala Ashe as Zari and Caity Lotz as Sara Lance/White Canary -- Photo: Dean Buscher/The CW -- ÃÂ© 2019 The CW Network, LLC. All Rights Reserved. DC’s Legends of Tomorrow — “The Getaway” — Image Number: LGN410a_0331b.jpg — Pictured (L-R): Dominic Purcell as Mick Rory/Heatwave and Brandon Routh as Ray Palmer/Atom — Photo: Shane Harvey/The CW — ÃÂ© 2019 The CW Network, LLC. All Rights Reserved. 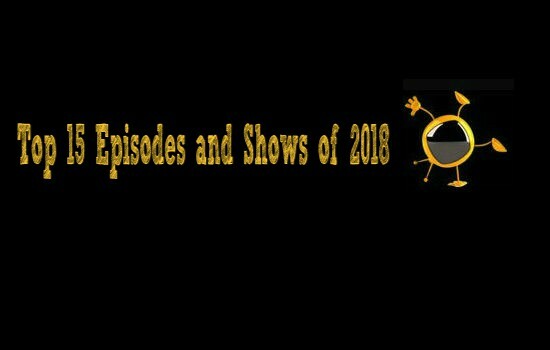 Let’s talk about Monday’s TV! How will the LEGENDS hold up when they can’t tell a lie? Things get tricky on the Monday, April 8 episode of LEGENDS OF TOMORROW. 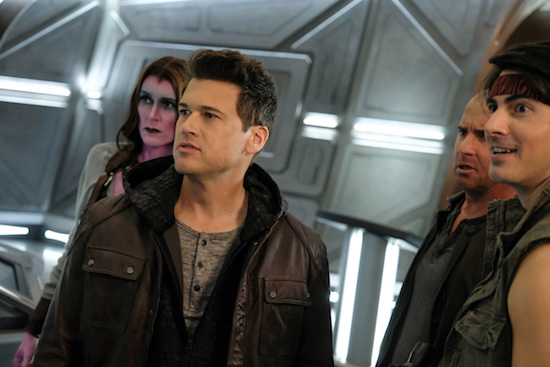 DC's Legends of Tomorrow -- "The Getaway" -- Image Number: LGN410a_0331b.jpg -- Pictured (L-R): Dominic Purcell as Mick Rory/Heatwave and Brandon Routh as Ray Palmer/Atom -- Photo: Shane Harvey/The CW -- ÃÂ© 2019 The CW Network, LLC. All Rights Reserved. 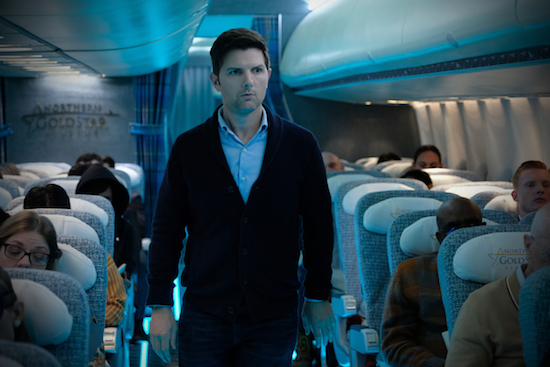 “Nightmare at 30,000 Feet” — Pictured: Adam Scott as Justin Sanderson of the CBS All Access series THE TWILIGHT ZONE available to stream on Monday, April 1st. Photo Cr: Robert Falconer/CBS ÃÂ© 2018 CBS Interactive. All Rights Reserved. LEGENDS OF TOMORROW is finally back on Monday, April 1, and the heroes are donning, uh, familiar costumes in the first new trailer. LEGENDS OF TOMORROW has been on a (very) extended hiatus, but it’s no joke that the show will return with new episodes starting on Monday, April 1. 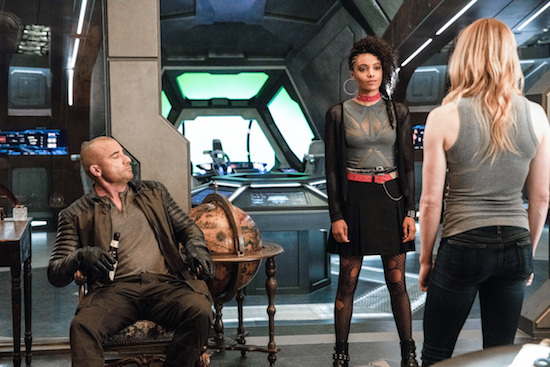 DC's Legends of Tomorrow -- "Lucha De Apuestas" -- Image Number: LGN409b_0013b.jpg -- Pictured (L-R): Matt Ryan as Constantine, Caity Lotz as Sara Lance/White Canary and Dominic Purcell as Mick Rory/Heatwave -- Photo: Dean Buscher/The CW -- ÃÂ© 2019 The CW Network, LLC. All Rights Reserved. Tags: legends of tomorrow, LEGENDS OF TOMORROW episode airing April 1, LEGENDS OF TOMORROW episode airing Monday April 1, Legends of Tomorrow episode airing November 26, Legends of Tomorrow photos, Legends of Tomorrow season 4, LEGENDS OF TOMORROW season 4 spoilers, LEGENDS OF TOMORROW: 'Lucha De Apuestas', LEGENDS OF TOMORROW: 'Lucha De Apuestas' Photos, When does LEGENDS OF TOMORROW return? The CW has officially set its finale dates. 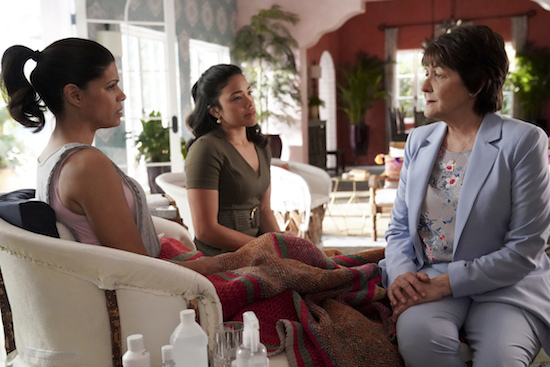 Jane The Virgin — “Chapter Seventy-Nine” — Image Number: JAV415b_0225.jpg — Pictured (L-R): Andrea Navedo as Xo, Gina Rodriguez as Jane and Ivonne Coll as Alba — Photo: Tyler Golden/The CW — ÃÂ© 2018 The CW Network, LLC. All Rights Reserved. The CW has fleshed out its midseason lineup. The final season of JANE THE VIRGIN will premiere on Wednesday, March 27. IZOMBIE‘s last chapter will kick off on Thursday, May 2. 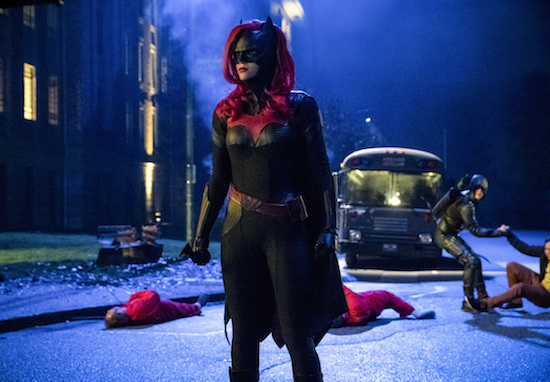 Arrow — “Elseworlds, Part 2” — Image Number: AR709d_0136b — Pictured (L-R): Ruby Rose as Kate Kane/Batwoman and Grant Gustin as Oliver Queen/Green Arrow — Photo: Jack Rowand/The CW — ÃÂ© 2018 The CW Network, LLC. All Rights Reserved. DC's Legends of Tomorrow -- "Legends of To-Meow-Meow" -- Image Number: LGN408a_0217b.jpg -- Pictured (L-R): Vesna Ennis as Garima, Nick Zano as Nate Heywood/Steel, Dominic Purcell as Mick Rory/Heatwave and Brandon Routh as Ray Palmer/Atom -- Photo: Michael Courtney/The CW -- ÃÂ© 2018 The CW Network, LLC. All Rights Reserved.